Angel Figure 6.5"H, Resin and stone mix, Holding Chain with Cross. Message of Peace: May Prayers of Peace give your family comfort and strength. Peaceful Blessings for everyone! 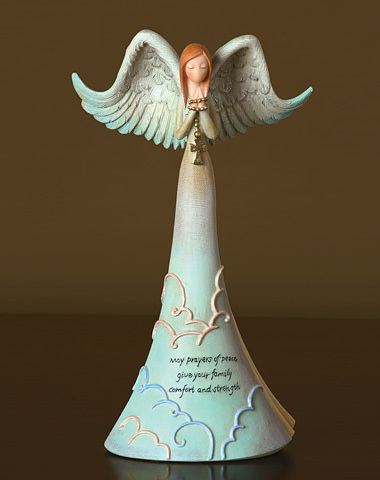 This handcrafted angel holds a delicate cross. A beautiful gift for your friends and family. Notice how her wings are spread open as if lifting her arms to heaven and the clouds around her skirt symbolize that all earnest prayers reach the heavens.